You can’t help but have noticed Sugar Beard on Instagram, the products are brighter than my 80’s outfits. The Sugar Beard Rhubarb & Custard Beard Balm has captured the scent of the sweets that I loved when I was a child. A while back I was asked on ‘Guardians of the Beard‘ if I had reviewed for Sugar Beard, a few of the guys were interested in the scents but were put off as there were no ingredients listed on the products or the website. So I messaged Sugar Beard and they sent three of their balms for review. I can tell you that they have now got their rear labels and the contain all that you need to know! The base ingredients for this balm are Beeswax, Mango Butter, Sesame Seed Oil, Caprylic/Capric Triglycerides (mix of coconut oil and glycerin), Argan Oil, Avocado Oil, Jojoba Oil, Vit E, Sunflower Seed Oil, Ginger root extract and Cocoa Butter. This has resulted in a medium firm beard balm, it is still easy to scoop from the tin but that could be down to the hot weather. Of course being a medium firm balm it takes a little working in your hands before you can apply and a little extra time working into the beard. The hold is very good, my beard is a messy beard and this has kept my beard looking good. It did make my beard feel softer but not by much. The Sugar Beard Rhubarb & Custard Beard Balm scent is made from fragrance oil, now this could be their blend or could be a ready mixed scent as they are available in so many scents. Either way it is spot on, a very nice scent that smells just like I have just stuck my nose in a bag of the Rhubarb & Custard sweets. 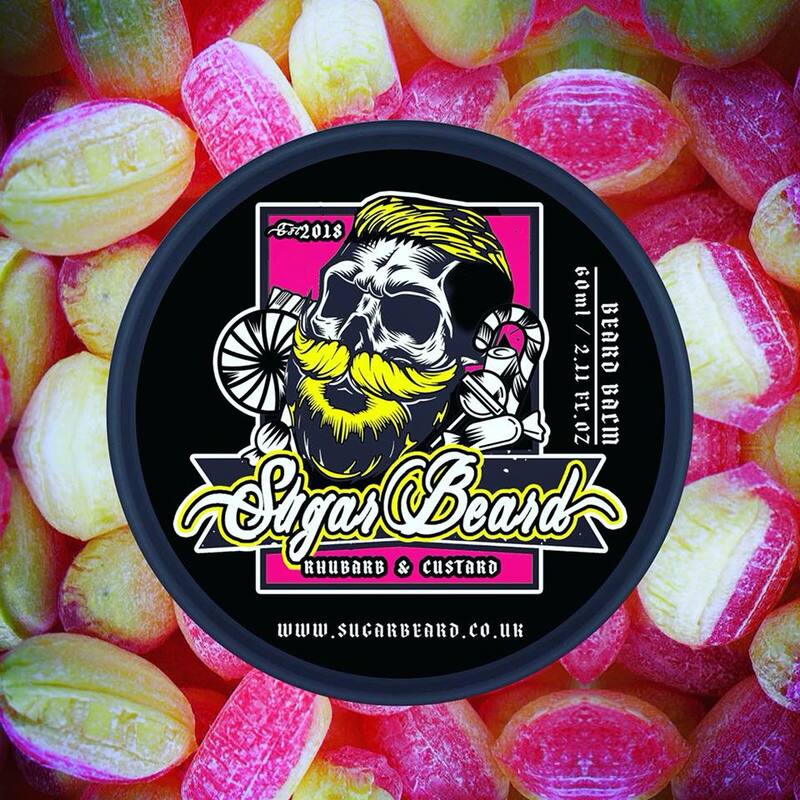 The Sugar Beard Rhubarb & Custard Beard Balm is available in 10ml for £4 or 60ml for £12 from their website. ← Top 5 Beard Balms & Butters You Should Buy!